*For this discussion I'll mostly be referring to the first Aladdin movie as it was originally intended, and less so to the entire Aladdin series (direct to video movies and TV series) that it would become. I just got done watching a video (This video: HERE) wherein the three popular fan theories surrounding the popular Disney movie "Aladdin" were discussed. I had never heard of these theories before and found them quite intriguing, so I now bring the discussion here. 1. The Merchant in the beginning of the movie, who is telling the story of Aladdin, is actually lying and made up the entire story. After the movie's first song the Merchant begins talking to an unknown customer from the audiences point of view, and begins trying to sell and number of defective items, but once he gets to the genie's lamp he starts to tell the fantastic story after the customer becomes disinterested in his items. 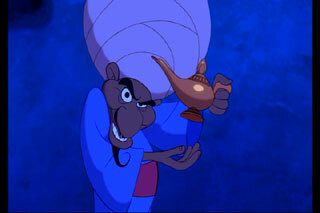 A merchant needs to sell his merchandise, and a good enough sales pitch can get the job done, therefore the entire Aladdin story was made up just to sell one old useless lamp. Both wear blue, have a red sash, and both have similar facial hair. Beyond that Genie and Merchant are the only characters in the entire movie that have 4 fingers. Every other person has 5 fingers, and it doesn't seem like the merchant visibly lost any fingers at some point in his life. Like Genie, he just has 4, and Genie got away with that for being a supernatural being. Also both characters are voiced by Robin Williams. 3. Aladdin actually takes place in the distant future. This last one has to do with timeline issues not matching up with what Genie says in the film. In the movie The Sultan says at one point "praise Allah" meaning Islam is the primary religion, and you can't get much further back in the past then 7th century, but Genie makes contradictory statements to this. Genie says he's been shut away in his lamp from the rest of the world for about 10,000 years, yet he mocks Aladdin's clothing as being too "3rd century" which he shouldn't have been out in the world to know about. If we go back 10K years from the 7th century then we're in the B.C. era of things. If Genie can recall the 3rd century then he was out at that time, and if he were imprisoned sometime soon after then Aladdin actually takes place around 10,200/10,300 A.D. in a post apocalyptic world where technology isn't prevalent anymore. Genie also makes references to modern day stuff like Disney movies, Jack Nicholson, etc., which he wouldn't know about if it were set in the past. So those are the theories, if you want a more complete look at them then watch the video. Otherwise out of the three I like the second one the most, and it makes the most sense without it being complicated with timelines or an easy way out by saying the movie was a made up story to sell some merchandise. Is there a theory you like the best? Is there a theory not already discussed? Do you have your own Aladdin theories? I prefer the Genie is Merchan theory. Everything else seems far to out there. xD Especially since all the Genie references seemed just like him (and disney) having fun to me. In the original drafts, the Genie actually is the Merchant. The ending was supposed to reveal that. However, they figured there was too much potential for more movies, so they opted to have the Genie remain semi-powered. The similarities you named are leftovers from that concept. It's still my head-canon though. The third theory also works if you count in the series and all the anachronisms there. Though I like to chalk it more up to the genie being the genie and having a loose concept of time.